Objective: Introduce the salon industry to a new system of hair color, including an educational model, a set of in-salon standards and a new brand. Challenge: The salon industry is filled with creative individuals; breaking through to this audience meant coming up with a press kit unlike anything they’d ever seen. Solution: Thirty press kits were sent to bloggers, magazine writers and other industry professionals. 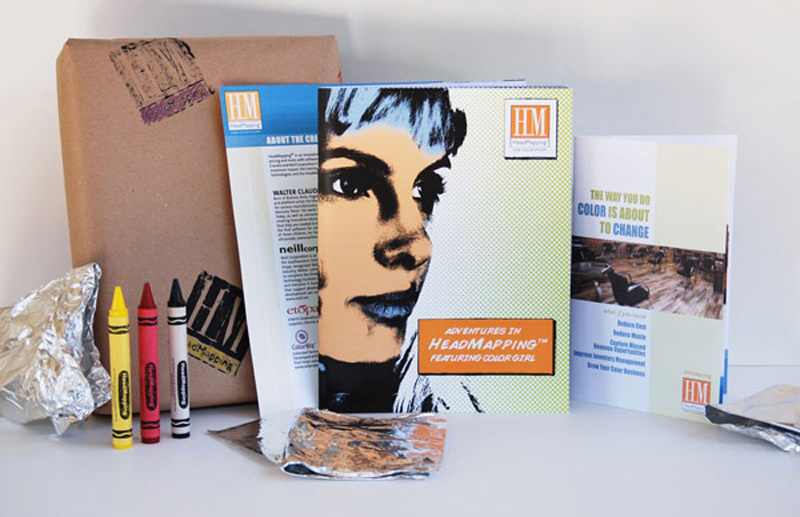 The kits included a custom-made coloring book entitled “The Adventures of Color Girl” which explained the entire HeadMapping system, as well as crayons re-labeled with hair-color formulas rather than traditional color names. The kits were packed with hair color foils, wrapped in brown kraft paper stamped with a HeadMapping logo and hand-colored with crayon. Getting one of these in the mail made receivers want to stop everything and open it up immediately. Delivery: Thirty press kits including coloring books, instructional brochures, custom crayons, hair color foils and a press release. Results: Press in national trade publications and buzz throughout the industry.